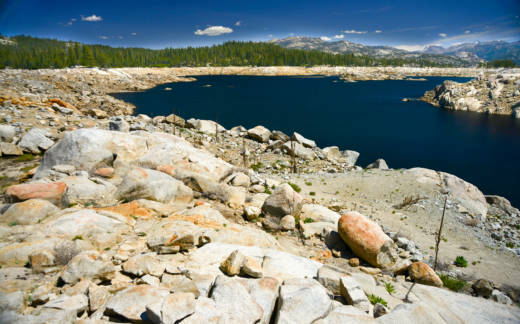 California's 2014 legislation, the Sustainable Groundwater Management Act (SGMA) was significant in that it was the state’s first major groundwater regulation. But Michael Kiparsky the founding director of the Wheeler Water Institute at the University of California Berkeley School of Law, says that it was also significant in another way. “It breaks with what had been decades of a legal fiction that groundwater and surface water were not part of a single hydrologic system,” he says. While rivers, lakes and other surface waters are often thought of – and regulated – separately from the groundwater below, the two are connected. Depleted or polluted groundwater makes for depleted or polluted rivers, and vice versa. SGMA acknowledges this by placing some responsibility for surface water conditions in the hands of local Groundwater Sustainability Agencies which need to adopt a plan by 2020 that will keep their local aquifers sustainable and prevent “significant and unreasonable” impacts on both the groundwater and surface water in the area. This, says Kiparsky, is a very exciting change, but one that is poorly understood. Many Groundwater Sustainability Agencies are not yet thinking about their own responsibility towards surface water, and not addressing these groundwater-surface water interactions could have significant consequences for how they manage their basin. To help bring these issues to the surface, Kiparsky and his colleagues produced a report on several important questions about how surface water-groundwater interactions affect groundwater management. Water Deeply spoke with Kiparsky about his report, and about the importance and complexity of groundwater and surface water. Water Deeply: When it comes to understanding how Groundwater Sustainability Agencies should be managing groundwater-surface water interactions, what are the biggest questions? Michael Kiparsky: The first key question for Groundwater Sustainability Agencies to answer is, how does groundwater management in their basin affect surface water and its beneficial uses? That implies that Groundwater Sustainability Agencies need to understand something about the hydrology of the basin and about those beneficial uses. This leads to another really crucial [point], which is that Groundwater Sustainability Agencies need to make a decision about what “significant and unreasonable” intersections between groundwater and surface water systems will be, and what a “significant and unreasonable” impact on the beneficial uses of the surface water would be. This is where the SGMA statute builds in some legal uncertainty – what does “significant and unreasonable” actually mean in the context of groundwater management in California? Ultimately, there is a two-part answer. The first is is that Groundwater Sustainability Agencies need to explicitly or implicitly, through the shape of their groundwater sustainability plans, determine what “significant and unreasonable” impacts actually are in their basin, and how they will take action to avoid those impacts. Water Deeply: Do you foresee a time when the questions that you bring up in this report will be answered definitively? Kiparsky: Definitive answers to everything about [groundwater sustainability] in the state of California seems to me a lot to ask. I would love to see that clarity, but I don’t expect that to happen anytime soon. But Groundwater Sustainability Agencies need to make their decisions around how to manage groundwater, and how that groundwater interacts with surface water in spite of the significant uncertainty that currently exists in the legal system and in the scientific understanding. By making decisions in the face of uncertainty, Groundwater Sustainability Agencies are going to overcome a range of hurdles. Those hurdles could include challenges to plans that they put forth – either legally or politically – or they could include determinations by state agencies to either influence or control a basin’s groundwater. My hope is that our work and the work of others can highlight this particular issue and spur more of the kind of integrative thinking that is required to develop solutions to this and a range of other SGMA issues. Water Deeply: One of the things that your report goes into is this overlap of responsibilities for regulating surface water and groundwater. Can you talk a bit about that? Kiparsky: The overarching message here is that collaboration is going to be very important for Groundwater Sustainability Agencies that are facing groundwater-surface water issues. There are multiple entities who have some sort of responsibility for these groundwater-surface water systems, or different parts of them, and there are multiple overlapping areas of law and regulation that have – at least in concept – some interplay between them. So, as we argue in our report, in order to manage the risk of failing to consider the multiple different interests that will come to play around groundwater-surface water interactions, it will be important for Groundwater Sustainability Agencies to talk with the other various parties, including the other state and federal agencies that have explicit interests in the groundwater-surface water interactions. But, there is also another important reason for Groundwater Sustainability Agencies to consider this collaboration, which is that these other entities already may have some expertise in the area. Groundwater Sustainability Agencies don’t need to necessarily reinvent the wheel here. There is potential for Groundwater Sustainability Agencies to expand their capacity by working with others. Water Deeply: What would be the implication of not thoroughly and thoughtfully addressing these points? Kiparsky: One of the implications is that a plan could develop that does not put a groundwater sustainability agency on the path to achieving sustainability by the time the law requires it to. Were that to happen, then the state, namely the State Water Resources Control Board, would have the responsibility and the authority to step in. Were that to happen, then the Groundwater Sustainability Agencies would lose its opportunity to craft creative solutions. A Groundwater Sustainability Agency has the advantage of local knowledge, and to think in novel and nuanced ways. The State Water Board simply does not, and probably will not. Therefore, if the State Water Board were to come in and rely on curtailments of groundwater extraction in a blanket way, then that removes some of what is really promising about SGMA.